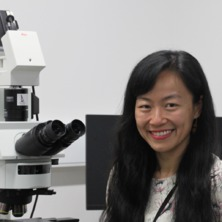 Dr. Mingyuan Lu was awarded her PhD from The University of Queensland in Febuary 2014. She has previously completed a Masters of Engineering (June 2009, Materials Science and Engineering, Central South University, China), and a Bachelor of Engineering (June 2007, Materials Science and Engineering, Central south University, China). Mingyuan has more than 10 years’ experience in research, and during this period she has gained extensive experience with material synthesis, mechanical mechanics, and material characterization including nanoindentation, nanoscratching, atomic force microscopy, electron microscopy, and focused ion beam milling (FIB); additionally,she has experience with structural and compositional analysis techniques (Raman, XRD, EDS, DTA, DSC etc.). (2015-2016) developed a new and successful FIB-machined micro-cantilever bending technique to study the fracture and interfacial properties of the protective intermetallic coatings on magnesium alloys: this technique can be applied to a wide range of materials, sub-surface structures and multilayered structures. Based on this methodology, they later developed a micro-bridge four-point bending technique. This approach can generate a “stable” interfacial delamination, and thus enables quantitative analysis of interfacial toughness. (2011-2014) developed an indentation-based methodology for assessing the interfacial adhesion of bilayer structures, in a joint project that was funded by WIN Semiconductor Co., Taiwan: the methodology developed has been used to test the reliability of SiN-passivated GaAs semiconductor wafer products. (2015-current) developing a selective laser sintering process for the additive manufacturing of porous and biodegradable scaffolds, made from a biopolymer, for bone tissue engineering: this innovative process can produce scaffolds without the use of an artificial 3D model, and the scaffold has a unique interconnected pore architecture and large surface area making it suitable for bone tissue regeneration applications. The promising outcomes of the preliminary study have elicited strong support from UQ; it has received two generous internal grants (a philanthropic grant for an ECR in the field of engineering, and SEED funding) to enable further study in this field. The scaffolds will shortly be tested in a pre-clinical mouse model (funded by SEEM grant) to study biocompatibility and osteoconductivity. (2007-2009) developed high-performance refractory metallic materials using powder metallurgy processes: in this project, they discovered the effect of trace TiC, ZrC Carbide nanoparticles on the mechanical properties, sintering behaviour and microstructure of molybdenum alloys. Surface modification is crucial for the design of high-value Ti parts with excellent tribological properties and will be developed into a major genre of technologies within the foreseeable future. This project aims to develop an innovative laser-based coating technology to deposit thick, dense and well adhered TiO2 protective coatings on a contoured surface of Ti alloy components. It addresses the issue of the current lack of surface modification techniques that are capable of depositing robust wear-resistant coatings on Ti alloys, which has limited the development of high-value Ti parts for aerospace applications. The outcome of the project will drive the design and production of durable Ti alloy aircraft components and will support the development of processes that will create high value manufacturing products. Additive manufacturing (AM) technologies has enabled the fabrication of scaffolds with a highly complex and completely interconnected pore network. This project aims to develop new AM processes for porous bio-polymer and bio-composite scaffolds for tissue engineering (TE) applications using novel powder formulations. Among various AM techniques, selective laser sintering (SLS) is used for producing TE scaffolds due to its ability to process a wide range of bio-engineering materials. In a SLS process, powder particles are selectively fused together with a focused laser beam in a layer-by-layer fashion based on the computer aided design (CAD) model of the part. The outcome of this project will lead to innovative SLS processes that would power new manufacturing industries for producing high value and innovative parts for bio-medical application. Currently available additive manufacturing processes have not yet been able to successfully produce full density and defeat-free ceramic parts. This project aims to understand the fundamental mechanisms involved in the selective laser sintering and selective laser melting (SLM) of ceramic materials. In this project, systematic investigation is carried out to understand the interactions between materials, process parameters, properties and surface/structure integrity involved in the ceramic SLM process. Interfacial adhesion is a critical property that can influence the reliability of flexible microelectronic devices, such as roll-up displays, wearable smart devices, flexible sensors and solar cells. The current design of film stacking sequence in the microelectronics devices is determined by the electrical and optical functionality and not necessarily optimized for mechanical performance. Failure often occurs at the interfaces between dissimilar layers, when the device is subjected to external loading. To improve the device reliability, characterization of the interfacial property is imperative. The current lack of reliable methods available to assess the interfacial adhesion of a complex multilayered structure in a small-scale integrated system has limited the development of the next-generation flexible microelectronic devices. This research is to develop reliable quantitative methodologies for measuring interfacial adhesion under a simulated stress state that is pertinent to the actual service condition in order to develop predictive models for delamination and interface degradation. The methodologies developed in this project are intended for the typical multilayer structures found in the contemporary flexible and stretchable microelectronics. However, these techniques, once developed, can be readily applied to characterise the mechanical properties of diverse materials and structures at nano- and micro-scale, such as adhesion of the interfaces/interphases in protective coatings on metal substrates, composite materials, solder and weld joints, the stiffness and strength of structs and fibres in cellular materials and biomaterials, as well as the inter-layer adhesion of parts fabricated using additive manufacturing techniques. Cheng, Hui-Chao, Fan, Jing-Lian, Lu, Ming-Yuan, Li, Peng-Fei and Tian, Jia-Min (2012) Preparation, performance and structure of high tenacious Mo-0.1Zr alloy. Zhongguo Youse Jinshu Xuebao/Chinese Journal of Nonferrous Metals, 22 1: 114-120. Lu Mingyuan, , Fan Jinglian, , Cheng Huichao, , Liao Yuehui, and Tian Jiamin, (2010) Influence of TiC Addition on Properties and Microstructure of Mo-Ti Alloy. Rare Metal Materials and Engineering, 39 6: 985-988. Fan Jinglian, , Cheng Huichao, , Lu Mingyuan, and Tian Jiamin, (2010) Effect of Vacuum Treatment and Ti Content on the Properties and Microstructure of Mo-0.1Zr Alloy. Rare Metal Materials and Engineering, 39 2: 338-342. Luo, Ming, Fan, Jing-Lian, Cheng, Hui-Chao, Tian, Jia-Min and Lu, Ming-Yuan (2010) Influence of rotary forging on mechanical properties and microstructure of Mo-Ti-Zr alloy. Zhongnan Daxue Xuebao (Ziran Kexue Ban)/Journal of Central South University (Science and Technology), 41 1: 97-102. Cheng, Hui-Chao, Fan, Jing-Lian, Lu, Ming-Yuan, Liu, Tao and Tian, Jia-Min (2009) Effect of alloyed element Ti on property and microstructure of Mo alloy. Zhongnan Daxue Xuebao (Ziran Kexue Ban)/Journal of Central South University (Science and Technology), 40 2: 395-399. Cheng, Huichao, Lu, Mingyuan, Fan, Jinglian, Tian, Jiamin, Huang, Boyun and Li, Yongming (2009) Effect of microelement Zr on the property and microstructure of Mo alloy. Fenmo Yejin Jishu/Powder Metallurgy Technology, 27 1: . Fan Jinglian, , Cheng Huichao, , Lu Mingyuan, , Huang Boyun, and Tian Jiamin, (2008) Effect of alloyed elements Ti, Zr on the property and microstructure of Mo alloy. Rare Metal Materials and Engineering, 37 8: 1471-1474. Lu, Ming-Yuan, Fan, Jing-Lian, Cheng, Hui-Chao, Liu, Tao, Tian, Jia-Min and Huang, Bai-Yun (2008) Effects of Ti on tensile strength and microstructure of Mo-Ti alloy. Zhongguo Youse Jinshu Xuebao/Chinese Journal of Nonferrous Metals, 18 3: 409-413. Lu, Mingyuan (2013). A nanoindentation study of SiN/GaAs film/substrate structures for analysis of the deformation mechanisms and interfacial properties PhD Thesis, School of Mechanical and Mining Engineering, The University of Queensland.